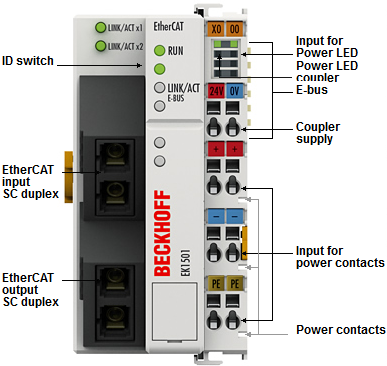 The EK1501 coupler connects EtherCAT with the EtherCAT Terminals (ELxxxx). A station consists of an EK1501 coupler, any number of EtherCAT Terminals, an EL9011 bus end cap or an EK1110 EtherCAT extension. The coupler converts the passing telegrams from Ethernet 100BASE-FX to E-bus signal representation. The multimode glass fibre connection enables distances of up to 2 km between two couplers – or up to 20 km for the EK1501-0010 with singlemode glass fibre connection. 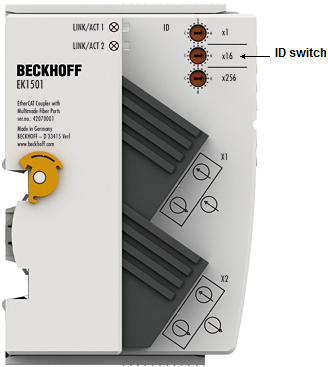 The EK1501 has three hexadecimal ID switches for assigning an ID to a group of EtherCAT components. This group can then be located at any position within the EtherCAT network. Variable topologies are therefore easily implementable.